Are you trying to get some gift ideas for firefighters? 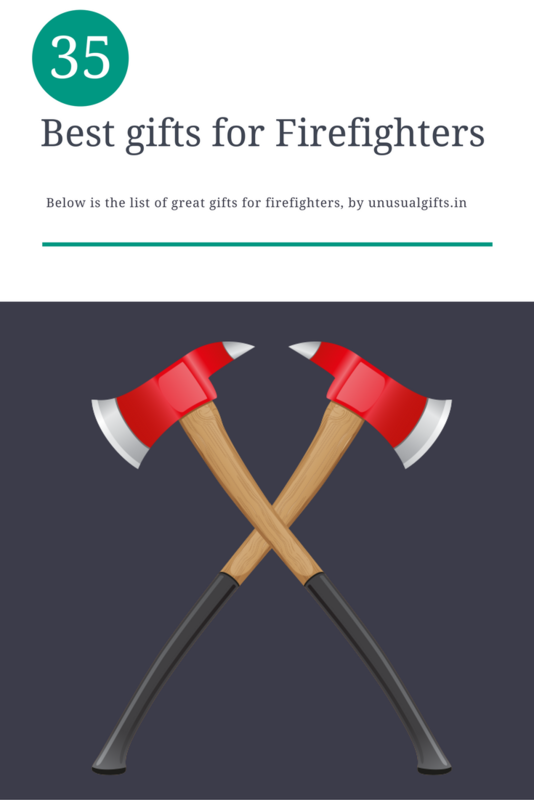 You may feel that finding gifts for firemen is difficult, but you just have to search a little bit and you will get many firefighter gift ideas. 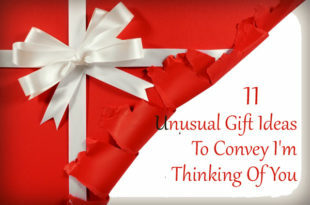 So be ready to keep them wondering how you always manage to get the right gift for them. 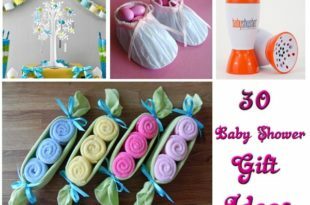 They are going to remember and appreciate the effort that you put to find a perfect gift for them. Below is the list of great gifts for firefighters. One of the great gift ideas for firefighters is a model of vehicle or accessory that was used before – like a Harley Davidson 1947 Fire Chief Service Car. 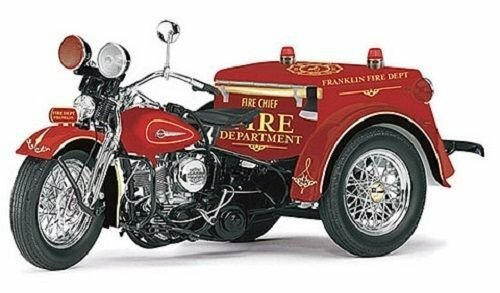 I found this beautiful and elegant model of Harley Davidson 1947 Fire Chief Service Car online and thought this can feature in the list of personalized firefighter gifts. This is an exact re-creation of the car and comes with scale-size accessories that were there in the actual car (an axe, chief’s hat, first aid box etc.). First gift in my list of gifts for firefighters is a small table décor and the figurine of a fireman gnome. The gnome figurine has a fireman hat and is wearing a red and black colored dress. The figurine is in a posture where he is carrying the hose to extinguish a fire. The small figurine of the fireman in the link is 10-inch tall and is made of Polystone. 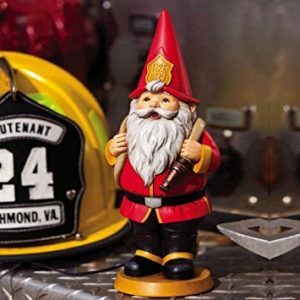 You will get fireman gnome with different uniforms. This is one of the tools that a fireman usually carries and will come handy when he is carrying out the rescue work. A rescue knife will definitely feature in firefighter gift ideas. 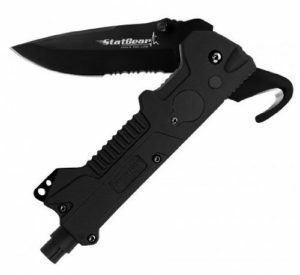 The rescue knife in the link has four utilities included in one knife. Using this knife we can cut a seatbelt and punch a window (can be used if someone is stuck inside a car). 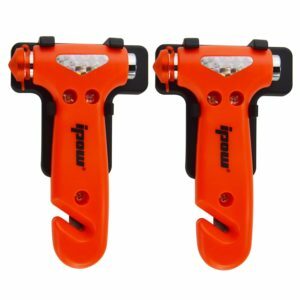 A serrated blade and LED flashlight is also included to help the fireman to complete the rescue work easily and faster. The pack comes with a nylon sheath for the safe storage of the knife. Next one in my list of gifts for firemen is a tool roll. The pack is made of 1000 Denier Cordura Nylon and is durable. This is fire hose tool roll helps the firefighter to carry around his tools easily and in an organized way. 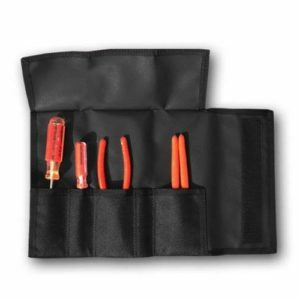 It has four pouches which can be used by him to store screwdrivers, spanners, or cable cutters. This can be rolled into one small pouch so that he can keep it in his pocket or in his car dash. The next gift I am going to discuss is something decorative and is one of the personalized firefighter gifts. I am referring to a fire hat birdhouse that can be hung indoor or outdoor as a decoration. The birdhouse that is made of resin and calcium carbonate is a whimsical decoration to the fireman’s house. By seeing this itself people will understand that the house is a fireman’s house. A fireman would love any gift that is related to his profession and fire hose is one of his primary tools at work. Hence, a fire hose belt can be added to your list of personalized firefighter gifts. The belt in the link has fire hose rubber on one side and woven fire hose material on the other side of the belt. 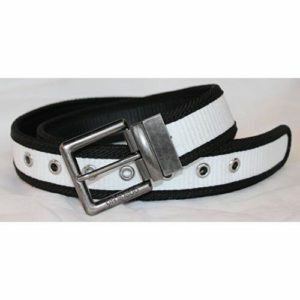 This is a reversible belt so he can wear it both ways. The next gift item in the list of gifts for firemen is a travel mug. This travel mug is used to keep the drink warm while driving. The mug can be plugged into any 12V outlet in a vehicle (in a firefighter’s case it will be the fire truck). The mug in the link is of red color with retro style design. The travel mug is thermal insulated and has an on/off switch for temperature control. A beach towel is one of the best choices as personalized firefighter gifts. The beach towel that I am referring to here is made of cotton and the specialty of this towel is that the fire department seal is printed on the towel. 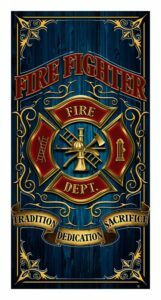 These beach towels will be of dark textured blue color and will fit as a great gift for the fireman. This firefighter beach towel has the measurements 30 x 60 inches (W x L). Perfectly stretchable with comfortable fabric (70% cotton, 27% nylon, 3% lycra). 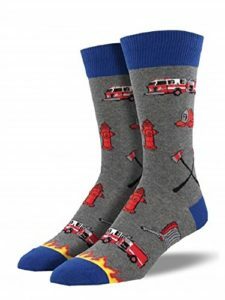 Crew Socks “Firefighter” is the perfect gift for the inner firefighter of any age. These socks are the perfect gift for any occasion – right from birthdays to religious holidays. One can never go wrong with this gift choice! In their busy schedule firefighters may face difficulties in keeping their money safe and in order. The money clips help them to keep their money safe. The money clips are just like paper clips we use in an office. The clip in the link has a firefighter Maltese cross engraved on it. You can get money clips which have other versions of firefighter cross engraved on them. 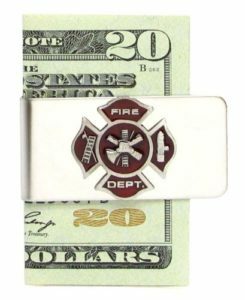 Money clips will surely feature in the personalized firefighter gifts and are very useful for them. 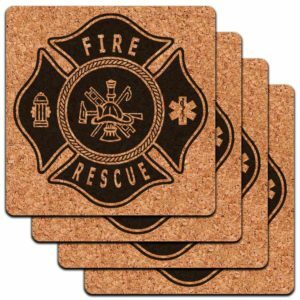 Next one in my list of gifts for firemen is a coaster set. We all know a coaster is used to keep a warm drink on a table so that it will not cause any damage to the table top. The fireman coaster set that I have mentioned here is made of durable resin and has the fireman cross printed on it. The pack comes with a holder with rubber padded base. Firefighters use gloves to protect their hands from extra heat and also from sharp objects. 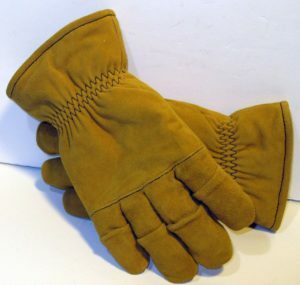 Usually, these gloves are made of leather or leather-like material. Gifting firefighter gloves is one of the great gift ideas for firefighters. The gloves in the link are made of leather to provide the comfort and dexterity while carrying out the rescue work. These gloves are waterproof and fire proof (which is a must for any firefighter gloves). Your friend is going to be delighted and will remember the care you have shown while selecting a gift for him. 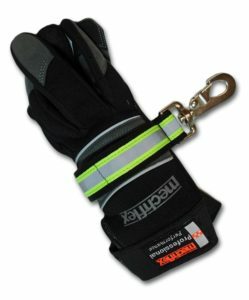 Another gift which can become one of the great firefighter gift ideas is a gloves strap. If the fireman you know already have the firefighter gloves, you can think about gifting him a glove strap to hang the gloves while he is not on duty. The glove strap in the link is made with nylon webbing underneath and florescent yellow webbing on top. The metal snap hook that comes with the pack enables him to attach the gloves to his belt. A clock, which can be considered as one of the personalized firefighter gifts, is the next one in my list. Here I am referring to a clock which is in the shape of a fire truck. 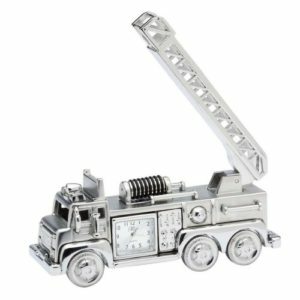 The fire truck clock in the link is made of zinc alloy and has a stylish and innovative design. The clock has a movable ladder and the wheels are turnable. These types of clocks can be great gifts for firemen you know. 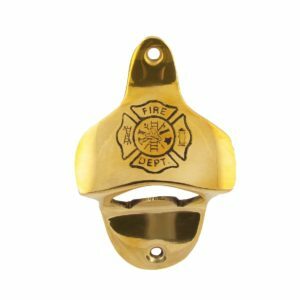 Next idea in the list of gift ideas for firefighters is a bottle opener. The brass bottle opener that I am referring to, can be mounted on a wall. The bottle opener has Maltese cross emblazoned across front side and you have to just place the cap top of the bottle below the cross. Now, the firefighter does not have to search for a bottle opener when he is thirsty. He can even mount this on his vehicle. A belt buckle is something that every professional will need and firefighter is no different. 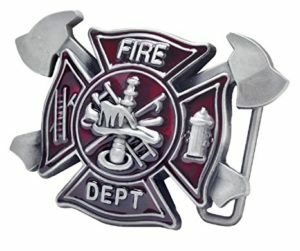 Next gift item in the list of gifts for firefighters is a belt buckle that has the fire department’s emblem engraved on it. You can get belt buckles with other firefighter symbols on it like a fire truck with the national flag on it. Buy one and gift wrap it properly with a message to the fireman you know and he will be delighted seeing that. Firefighters will need many accessories while carrying out a rescue mission and flashlight is one of them. Why don’t you surprise him with this LED flashlight which will be a great addition to his tool set? The LED flashlight case is made of tough nylon and the unbreakable lens (made of Lexan) comes with an anti-scratch silicone coating. The lens is assembled in an O-ring so that it does not break or get damaged. This will surely feature in the list of simple gifts for firemen. Next gift item is another rescue tool which the fireman can use for himself and also on duty. The car self safety tool can be used by anyone, not only by a fireman. However, a firefighter will have the most use of it since his duty is rescuing people. You can consider this as one of the gift ideas for firefighters. He can use this tool to cut the seat belt and punch a glass window using the double headed hammer. The tool also has a holder so that he can fix this in his vehicle. Well, this is one of the personalized firefighter gifts that you can present to the fireman you know. 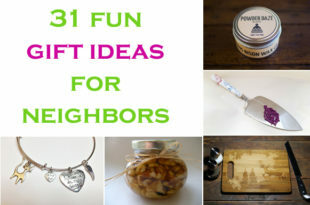 I have listed out a bar set as the gift because this will help him enjoy a small cocktail party when he gets free time with his friends. The bar set in the link comes with all the essentials needed for a small bar. 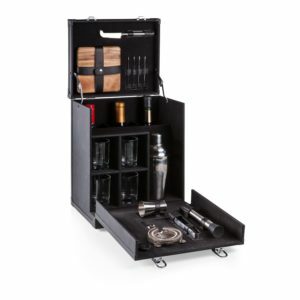 The bar set comes in a wooden box and has room for three liquor bottles. The pack includes 4 glasses, 4 picks, and ice cube picker. Next gift item in my list of personalized firefighter gifts is a unique one. 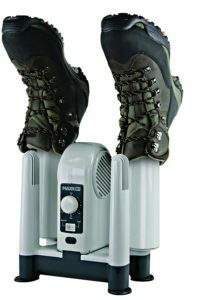 A boot and glove dryer which he can use in between the duty. There are chances that his gloves or boots are wet after a rescue mission and he needs to be ready if there are any emergencies. The dryer in the link can be used on four garments at a time and can produce up to 40.5 degree Celsius. 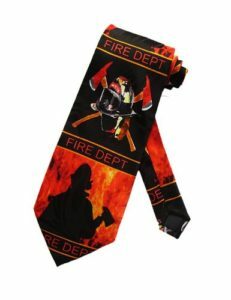 You can consider a firefighter tie as one of the firefighter gift ideas. The tie in the link is made of polyester. This firefighter tie depicts fire department seal (a fire axe and helmet) and silhouette of a fireman. He can wear this for any party and the shades of red, black and gray are so vibrant that it completes any fireman’s dress up. You will get ties with different designs or pictures. Select one that is appealing to you. Next one in the list of gifts for firefighters is a light bar which can be attached to the helmet. A Helmet is a part of fireman’s uniform and usually, they will wear a light attached to the helmet. You can gift a helmet light bar to the firefighter you know so that he can wear it comfortably and the helmet light bar in the link – – has 3 zoomable LED lights attached to it. 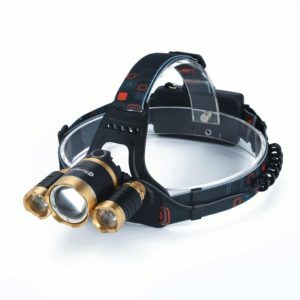 You have 4 modes for this headlight – you can light up only the center light, you can light up the two small lights, you can light up all the three and the strobe mode. 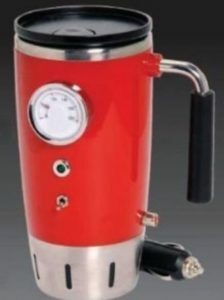 Another gift idea that came to my mind while compiling this list of firefighter gift ideas was a drink dispenser You will be thinking how a drink dispenser can be a gift for the fireman. 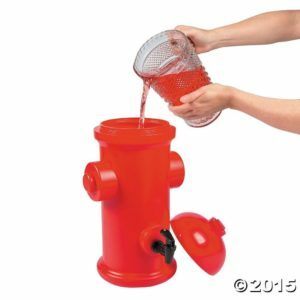 Well, the drink dispenser I am referring to is in the shape of a fire hydrant. The drink dispenser in the link can be carried around easily and he can fill any drink inside the dispenser. The dispenser has a tap at the bottom so that he can pour the drink to a glass. The sight of this drink dispenser itself will make the firefighter happy. 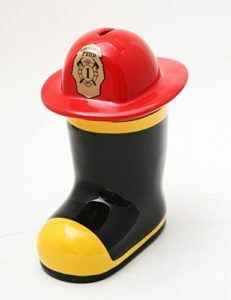 I saw this 8-inch tall firefighter figurine when I was searching for gift ideas for firefighters. The firefighter figurine conveyed a touching message without any quotes written on it and is an ideal way to say thanks to him. 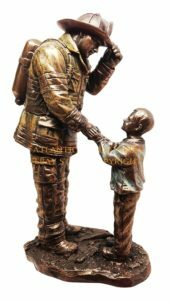 The figurine depicted a child thanking the fireman who rescued his life. The hand polished figurine reminds us to be thankful to all firefighters and rescue workers. Well, gift bags are used to distribute gifts to others. The firefighter you know will be surprised by seeing this as a gift. 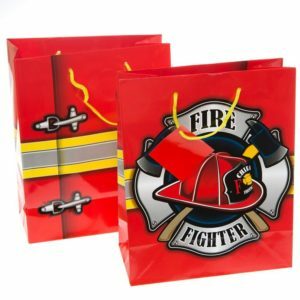 But, the pack contains 12 gift bags and he can use these to present gifts to his loved ones in a personalized manner. So this can be featured in the list of personalized firefighter gifts. The gift bags have the helmet and the cross printed on it. A tea light holder can be a great addition to your room decoration and also can be used along with aromatic candles. 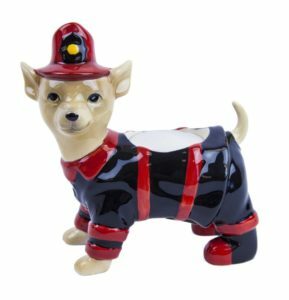 The tea light holder in the link is in the shape of a Chihuahua wearing a firefighter gear. There is a space on Chihuahua’s back to hold a candle or LED light. The pack comes with a candle that can be replaced with another candle or LED light. These tea light holders can be great gifts for firefighters. Next in my list of gifts for firemen is a flask that they can carry while traveling. 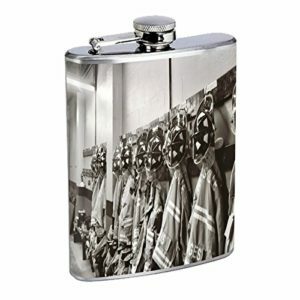 The flask has firefighter’s uniforms imprinted on it. This is made of stainless steel and the capacity is 8 ounces. This drinkware which has blazing silver color outside is one of the perfect firefighter gift ideas. After a long day’s work the firefighter would like to have a drink and there is no other perfect gift than a wine bottle holder for him. 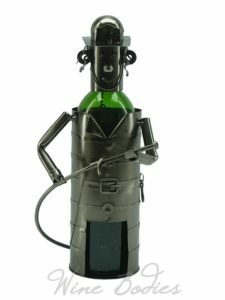 The wine bottle holder in the link is in the shape of a fireman holding the hose. This metal wine bottle holder is handmade and has a stylish design. This will definitely feature in gifts for firefighters and he will be delighted to see this. This is a gift which will let him capture a special moment in his life. Buy one picture frame for him and be assured that he is going to place it on his desk. 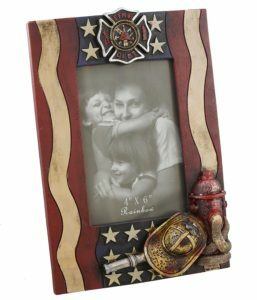 The picture frame in the link is a decorative picture frame with fire department symbols. It can hold 4 x 6 inch photos. Gift wrap this picture frame and present this to him. 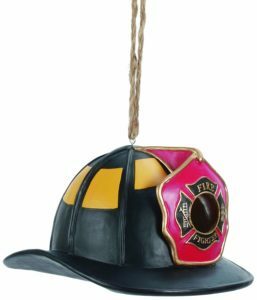 This helmet wall mount can be considered as one of the great gift ideas for firefighters. 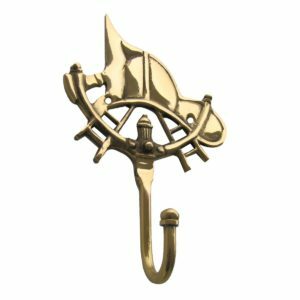 The helmet wall hook is made of brass and is in the shape of a fire helmet. This can be used as a helmet holder or a key holder or a hat rack or can be used to hang his coat. Well, this is a gift for those who love money bank. This is a unique gift and is crafted for a fireman. The piggy bank in the link is in the shape of a fire boot and on the top of that you can see the fire hat. Ceramic is used to craft this gift and it is hand painted in red, black, and yellow colors. 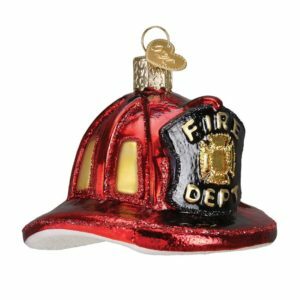 The next gift in the list of gifts for firemen is a set of ornaments which he can use for decorating his house for festivals like Christmas. This fire helmet ornament is made of glass using old techniques. The ornaments are hand painted and glitters are also used to make these ornaments beautiful. Buy a set of these and gift it to the firefighter you know. Well, this is a gift for book lovers in firefighters or any fireman who has a small library at home. A bookend is used to keep the books safe from falling and is kept at two ends of the rows. 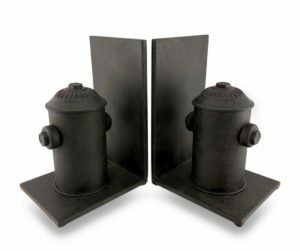 The fire hydrant bookends that I have mentioned here are great gift ideas for firefighters since it is made in the shape of two fire hydrants. 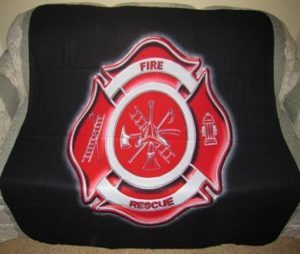 Next one in the list of gifts for firefighters is a throw blanket that can be used by them while traveling or on duty. We use throw blankets for the extra warmth when we are outside. The throw blanket in the link has the measurements 50 x 60 inches. The blanket has fireman cross and all other fireman logos printed on it so that this can be used even on duty in a winter season. All these logos are printed on a black background and can be hanged on a wall easily. The last gift in my list of firefighter gift ideas is an apron. This idea came to my mind when I saw this firefighter apron online while I was searching for an apron. The apron is made from cotton and comes in a tan color with reflective strips (yellow). 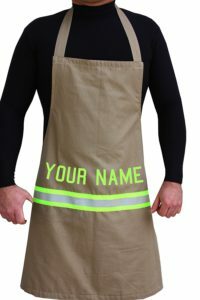 This can be made into a personalized gift by getting the fireman’s name printed on the apron. In the link, the seller has provided the option to customize the apron with a preview button. 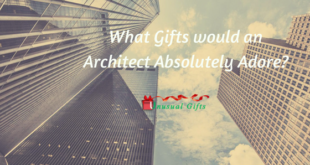 What Gifts would an Architect Absolutely Adore? 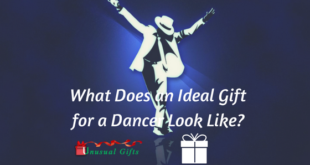 What Does an Ideal Gift for a Dancer Look Like? 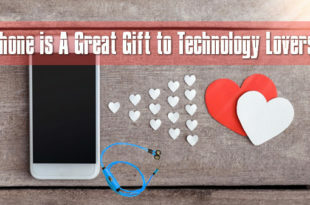 12 Exclusive Gifts for Welders which are Better than Perfect! 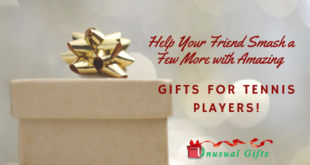 Help Your Friend Smash a Few More with Amazing Gifts for Tennis Players!